Today, we’re going to talk about when to capitalize titles. What I mean here is when to capitalize mom or dad, military ranks, honorifics, job titles, and so on. You do capitalize a title when making a direct address (calling someone by “name”). You also capitalize a title that’s being used in place of a name. How do you like Arizona, Mom? Before the airplane took off, Dad stowed his bag under the seat. I was not going that fast, Your Honor. In each of these examples, you could sub out the title for a name. How do you like Arizona, Suzanne? Before the airplane took off, Tom stowed his bag under the seat. I was not going that fast, Frank. You do not capitalize a title when you are not making a direct address, when you would use the title to indicate a role. My mom is in Arizona for the winter. The lieutenant will hear about this. The judge only sentenced me to a fine and community service. Here’s how these would look if you tried to substitute a name. My Suzanne is in Arizona for the winter. The Tommy will hear about this. The Frank only sentenced me to a fine and community service. This should help you see how in the second set of examples, you would have to change the sentence to make it work with a name. That’s an easy way to tell whether or not to capitalize titles. Hello, everyone! I’m back from my too-long holiday break. I hope you didn’t miss me too much! Today’s post comes from an email request. It’s about properly using apostrophes, especially in dialogue. Apostrophes are a huge topic, so first I’ll cover what I think this requester was really wanting to know, which is how we handle what I’ll call dialogue within dialogue. In other words, how do we handle it when one of our characters is quoting someone else? This is done by following the regular rules for dialogue, except that you need to use single quotation marks (or a single quotation mark and an apostrophe, however you prefer) around the quoted text. Here are some examples. 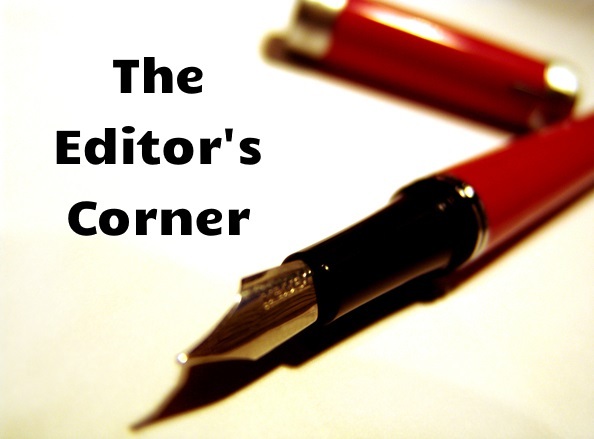 Every Saturday for the foreseeable future, I’ll be here in the Editor’s Corner, simplifying some of these grammar concepts for you and showing you how they specifically apply to your fiction. Coming up next week is Using Apostrophes. When you were in school and writing research papers, essays, etc., you were probably taught, like I was, that you shouldn’t use contractions in your writing. We were supposed to avoid them at all costs, as they make our writing too intimate to the reader. Our teachers instead wanted us to create a professional distance. But when we’re writing a novel, we’re not writing a research paper. This is one of those “rules” that fiction writers should be ready, able, and willing to break. What you write should mirror real life. People in real life who avoid contractions sound stiff and formal, and you don’t want your characters—who you want your reader to “bond” with—to feel stiff and formal. You can go the route of avoiding contractions for effect. If you’re trying to create a stiff, formal character, for example, then you can leave contractions out of their dialogue. You have to be careful about the effect you’re going for, though. I once edited a manuscript where the bad guy was differentiated by speaking normally during the first part of the book and very formally in the latter part of the book. I was confused by the difference, and the author didn’t reveal to me until after the fact that they had made the change on purpose. If you want to avoid using contractions for effect, you need to make sure you’re consistent in avoiding contractions, or you risk your reader being confused and possibly turned off the book. The moral of this story is: Use contractions for more lifelike dialogue, and avoid contractions for effect. Do you have any rules you would like to see discussed? Let me know in the comments, and I’ll be sure to address them. Every Saturday for the foreseeable future, I’ll be here in the Editor’s Corner, simplifying some of these grammar concepts for you and showing you how they specifically apply to your fiction. Coming up next week is my Homophone of the Month (fair vs. fare).